Begin this adventure with a ferry ride into SF and head north across the Golden Gate Bridge for beautiful loop around the Marin Headlands on Conzelman Rd up to Hawk Hill followed by a scenic jaunt around the Tiburon Peninsula along Paradise Dr. Begin at Larkspur Ferry Terminal. Ferry ride to San Francisco. Boats and ships around the bay. Meet up at SF Ferry Terminal. Ride along The Embarcadero towards Pier 39. Continue through Fisherman’s Wharf area on Jefferson St.
Exit Jefferson St onto multi-use trail through Aquatic-Maritime Park. Up Van Ness Ave for detour through Fort Mason-trail along the harbor is currently closed. Connect to multi-use trail through Ft Mason Green. Continue on the Marina Blvd multi-use trail along Marina Green and Yacht Harbor. Stay straight onto the multi-use trail on Old Mason St through the Presidio area and Crissy Field. Exit Old Mason St and continue through the parking lot towards Warming Hut Cafe. Climb Long Ave towards Lincoln Blvd and continue on Battery E Trail towards the Golden Gate Bridge Plaza. Ride north across the Golden Gate Bridge. Brief stop at Vista Point. Continue north on multi-use trail towards Alexander Ave to the narrow 101 underpass. Climb Conzelman Rd up to Hawk Hill-Marin Headlands. The first section is the steepest with 9-11% grades. The second section eases down with lesser grades of 3-5% up to the traffic circle at McCullough Rd. The third section tilts up again with 6-9% grades up to the summit at Hawk Hill. Descend Conzelmand Rd to the Lower Coastal Trail parking lot-It’s STEEP-use caution! Continue on Conzelman along Clydes Ridge pass the old concrete batteries to Field St.
Descend Field St to Bunker Rd and continue east through the Headlands along the valley floor to the single lane tunnel. Bunker Rd drops down towards Fort Baker at Cavallo Point to East Rd. The climb up East Rd to Alexander Ave has 5-8% grades. Descend Alexander Ave to Bridgeway for a scenic ride through Sausalito. Lunch stop at Dunphy Park. Continue on Bridgeway to the Mill Valley Sausalito Path. Cut across Pickleweed Inlet to Bayfront Park. Continue on Hamilton Dr and Redwood Hwy to Seminary Dr.
Ride along Richardson Bay and up around Strawberry Point. Harbor Cove Way to Greenwood Cove and Blackie’s Pasture. Roll along Richardson Bay on the Tiburon Linear Park Trail. San Rafael Ave and Beach Rd to Belvedere. Main St into Tiburon with fantastic views along Shoreline Park. Ride on Paradise Dr with bay views from Lyford Stone Tower. Rolling terrain along Paradise Dr to Romberg Tiburon Center. Stay on Paradise Dr into Corte Madera. Continue on multi-use trail along Corte Madera Marsh on Redwood Hwy. Stay on Redwood Hwy to narrow Bike/Ped pathway to Larkspur Ferry. Return through ferry parking lot and overhead ramp to Country Mart. A ride across the iconic Golden Gate Bridge up to the Marin Headlands is a must-do if you’re in the SF/Bay Area! You’re greatly rewarded for the climb up Conzelman to Hawk Hill with breathtaking views of the Pacific Ocean and the City. 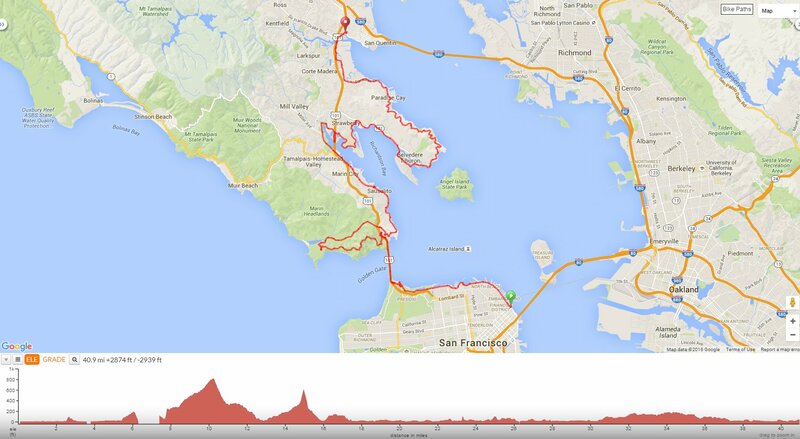 You’ll also enjoy the scenic loop around Richardson Bay on Paradise Dr into Tiburon. Weather: Sunny and warm. Temps ranged from the high 50’s to the low 70’s with brisk NE winds.